Art = Life at R.L. Delight Fine Art: I Am Back! Neahkahnie Mountain, at the Toe! Fall is here and, right on schedule, our first fall storm on the Equinox. It has been not quite four weeks since my surgery and I am healing well. So well that I am chaffing at the restrictions. Fortunately I was told I could walk and so I have been. 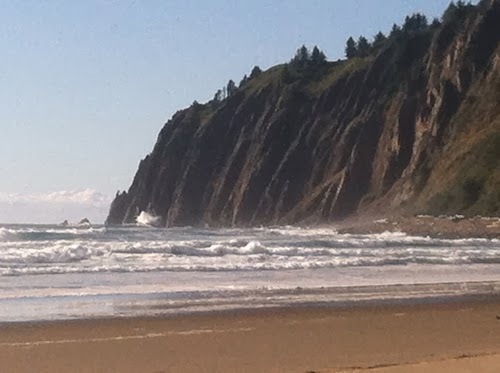 I walked up to the foot of Neahkahnie on the beach during the storm to admire the waves. They have returned in full force and looked magnificent! It was about a four mile round trip walk in pouring rain and thundering surf. The smell of Shore Pine and Cedar mixed with the smell of the sea which will always remind me of home. Technically, I have to admit, I have about 2 more weeks of the "no heavy lifting" period. I have been pretty good at taking care and I am healing well and faster than the doctor anticipated. I credit it to healthy living and good wholesome organic vegan whole foods. Today, I just couldn't stand it. The storms have passed, the sun was out, and the waves were lovely. This morning I very carefully hefted my painting pack an inch or so off the bench. Hmmm, heavy. Perhaps if I unload some of the weight, lift it up to my higher platform where I can reload it and slip it on without using my abs. Bingo! That worked! I very carefully walked around my house with my attention on how my abdomen felt. I hardly felt a thing. While I was walking around the house, I stepped on the scale. I have never weighed my loaded pack before. It weighs 17 pounds. The waves were calling. I had to go paint. I got everything ready to go and off I went. I drove to the beach and parked and then very carefully slipped on my pack from the car seat without having to lift. The pack weight sits on my hips and anchors from my shoulders as any good backpack does. I still had a little less than a quarter of a mile to hike on the beach to reach my usual spot. I walked slowly and carefully, half my normal pace, in spite of my impatience to get there. I found a large log to repeat the supported offloading of my pack and happily set up my easel to paint. 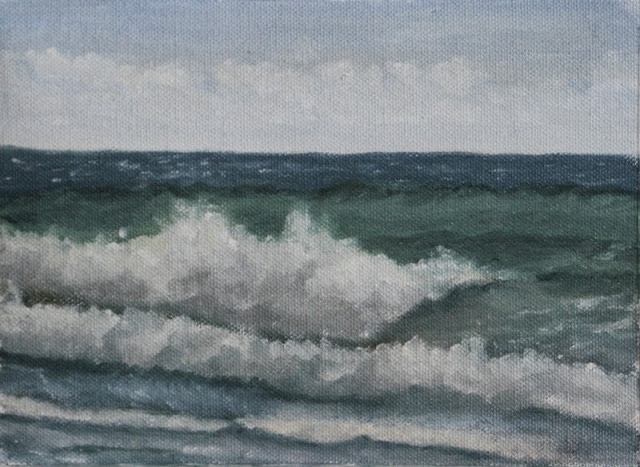 I am woefully out of practice and messed up on the swells in the painting by going too light too soon. I didn't really have any high expectations for this wave study. I just was happy to be out painting. Here is Wave Study #58. It is time to get these studies done! © 2013 R.L. 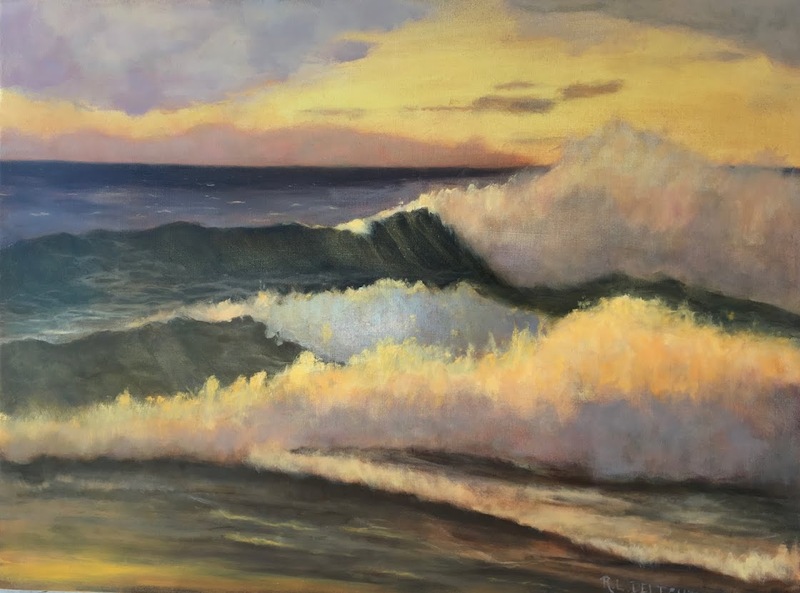 Delight, Wave Study #58, 6"x8", oil on canvas. I will wait until the canvas is dry and then repaint the swells properly. The photos never do the subtle colors justice on these paintings. Other than the swells, I am fairly pleased. Still plenty of room for improvement. The waves were piling up with the shore breakers coming in at an angle to the beach as they hit hidden sand bars and rocks. The tide was coming in. I am tired but satisfied at the moment. I will see how I feel physically tomorrow but I will be heading out now as often as possible.